Sweet Potato Almond Soup – A thick and hearty soup, full of flavor, yet ready in under 30 minutes. Perfect for a weeknight meal. This soup was inspired by all the African Peanut Stews I see all over Pinterest and elsewhere. I always think they look so hearty and delicious. However, seeing as I have never attempted to make one of those, I really have no idea if this soup resembles them at all or not. But, what I can tell you, is that this soup is thick and rich and full of deep earthy flavors, yet has a brightness from the tomato. It’s also quick and easy, like any good weeknight meal should be. 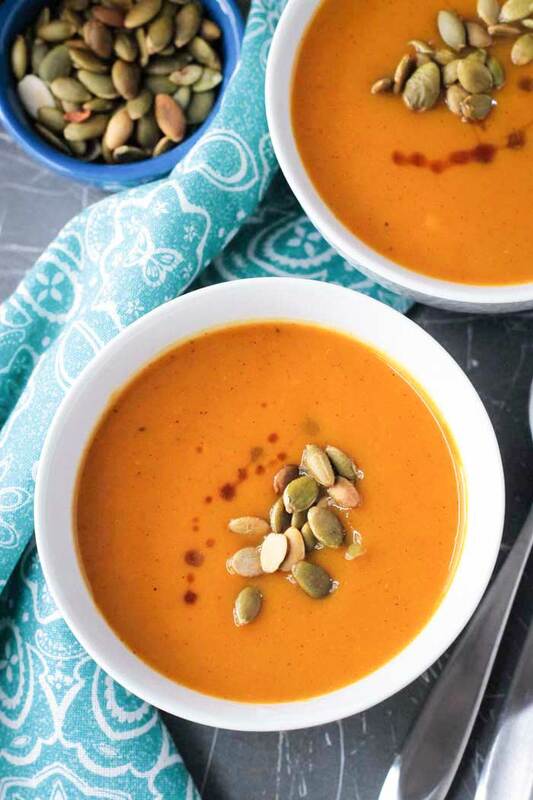 I could eat this Sweet Potato Almond Soup all day long! I would love to tell you that this Sweet Potato Almond Soup has won over even the sweet potato haters in my life, but that might be taking it a bit too far. 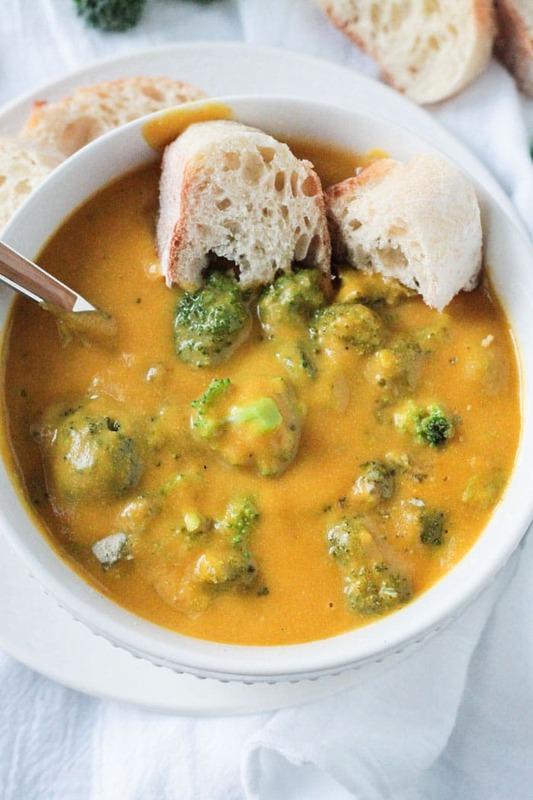 I happen to adore these orange veggies and, if you do too, then this soup is for you! I also imagine this would work just as well with peanut butter, but I haven’t tried that yet. And, of course, this would be amazing with a swirl of sriracha on top! Sweet potatoes are incredibly high in vitamin A, vitamin C, B vitamins, potassium, and fiber. It has been shown that including some healthy fat (hello, almond butter) in a meal increases the absorption of beta-carotene (vitamin A), which is why this soup is the pretty much the perfect dish. Guaranteed to keep you warm all winter long! I hope you guys love this Sweet Potato Almond Soup as much as I do. If you try it, please come back and leave me a comment below with your feedback. You can also find me on social media. Be sure to tag @veggie_inspired and #veggieinspired so I’m sure to see it. Enjoy! A thick and hearty soup, full of flavor, yet ready in under 30 minutes. In a soup pot over medium heat, sauté the onion and garlic in 1/4 cup veggie broth until softened, about 5-6 minutes. Add the sweet potatoes, spices and remaining 3 3/4 cup of vegetable broth. Bring to a boil, reduce heat and let simmer for about 20 minutes until sweet potatoes are fork tender. Add the almond butter and diced tomatoes. Remove from heat and puree with an immersion blender to desired consistency (I like a few chunks left). I like it super thick, but if you like a thinner soup, you can thin it out with more veggie stock or water. Can i use almond milk instead of the butter? Hi, Lydia. You use a splash of almond milk, but the flavor and texture just won’t be the same. The almond butter makes it really creamy and gives some depth of flavor. The almond milk would make it more of just a sweet potato soup – which would be delicious I’m sure, just not the same thing as I was going for here. Let me know if you try it. Hey do you think the tomatoes are essential? I wanted to make this soup for someone who is allergic to tomatoes. TIA! Hi, Kinsey! Glad we connected last night over messenger. I’m going to answer here, too, in case anyone else is wondering. I do love the flavor the tomatoes add to this soup, but I don’t think they are absolutely necessary. You’ll need a little more liquid to loosen things up, like veggie broth or plant milk, and I would add a few dashes of balsamic vinegar maybe for extra depth of flavor. I’d love to hear what you end up doing and how it turns out! Oh my gosh I have to try this! Two flavor combinations I’ve never thought of but sounds AMAZING! Thanks, Steph! I hope you enjoy it. I would love to know how it turned out when you try it. I’ve made African Wat (stew) several times and I would say that Yes, you nailed it! 😉 Can’t wait to try your version! Wow, thanks, Gwen!! You must come back let me know how mine compares to the originals!! Oh my goodness …I would never have thought about using almond butter in such an application! Totally intrigued by this recipe! It’s a winner! Thanks, Kimberly! I love sweet potato so much and I’m trying to make more things with it! Now this soup is on my list! Great, Shadi! I hope you love it! Please let me know what you think when you try it! If this doesn’t win over the sweet potato lovers, nothing will! This looks absolutely amazing, Jenn! And I’m intrigued with the peanut butter idea. Thanks, Linda! It’s seriously delicious and I just keep buying more sweet potatoes so I can keep making it! I could do with this almond soup right about now!! Looks so appetizing and comforting. Like a puppy on a warm day! and I love puppies, as much as I love this soup! Awwww, who doesn’t love puppies! You should eat this soup while watching puppies frolic. Perfect! Jenn, this soup looks delicious! I’ve only added peanut butter to a soup before, but I bet the almond butter adds a lovely flavor, too! Thanks, Lisa! I have never had either kind of nut butter in soup before this one. It turned out so well! Thanks, Sina! I LOVE soup in the cooler months…it’s all I want to eat! Aw, thank you so much. You are so sweet! I hope you enjoy it! This is my kind of recipe! Great flavors that come together easily. And I love nutty soups! Thanks for a great recipe Jenn, I’ll be trying this for sure. Thanks so much, Gin!! Please come back and let me know how it turned out! Nut butter in soups is such a brilliant idea. I’m definitely going to try this! Thanks, Christine! Please come back and let me know how it turns out! I love a West African peanut based stew and love your riff on it for this soup. Pinned to make when it gets really cold! Thanks for the pin, Helen! I hope you try it and love it! I love Sweet Potato Soup, but I’ve never had it with almond butter. Sounds intriguingly good – must try! It’s a great combo! I hope you try it! This soup looks delicious! I love using an immersion blender for soup – so easy! These flavors are perfect for fall and I love the addition of the almond butter! Thank you, Sherri! The immersion blender is one of my favorite kitchen gadgets! The almond butter is brilliant! Love this veggie packed recipe! Thanks, Jenn! The almond butter gives it such a great flavor in addition to making is super creamy! This looks so amazing Jenn! I LOVE sweet potato soup and make it quite often and can’t believe people don’t like them, lol! My hubby is the same way and will not eat sweet potato soup, however he will devour my sweet potato burgers…weirdo! The almond butter is such an amazing idea! I definitely need to try that next time I make some! Thanks, Brandi! I think men believe sweet potatoes aren’t manly enough or something. LOL! 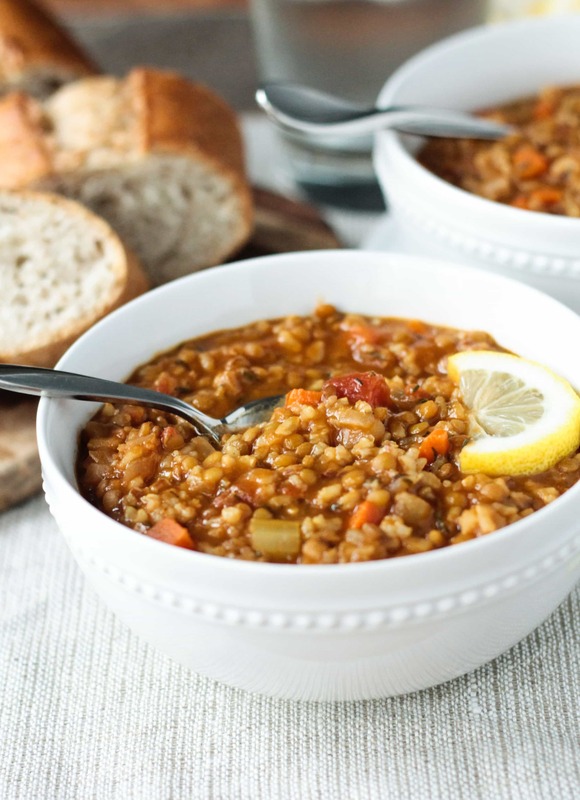 The almond butter works so well in this soup! I can’t stop eating it!! Thanks so much! The almond butter adds extra creaminess and tons of flavor! I hope you enjoy it! Who can hate a sweet potato?! I love them and am so excited to dig into them this season. This recipe looks great! Thanks, Kelly! I know! I actually know so many that turn their noses up at sweet potatoes. More for me! Hello! Looks so vibrant! The tomatoes are an interesting touch..never added them in a potato soup but I am going to try! I’m a humongous fan of sweet potato soup…sweet potato anything really…but I never would of though to pair with almonds!!! I’ve never had African peanut soup either, it sounds very exotic, so I think I would rather gradually enter the nutty soup world with this your recipe. This I know I will love <3 Oh and my whole family are sweet potato haters…crazy people! Silly sweet potato haters! More for us!! I hope you love it….let me know if you try it! I’ve never tried the African Peanut Soup! My hubby used to snuff at sweet potatoes but now he actually is okay with them in the ways I use them. I have to admit, I can only handle so much sweet potato though so I don’t overdo it in my stuff…but I love the flavor combo in here and I bet it’s amazing!! My kids just love soup so I’ll have to try this for them! Well, that’s promising, Sophia! My husband’s tastes have considerably changed over the years, but potatoes are still on his do not eat list. 🙁 Perhaps there is hope one day. My kids love soup too! I have one daughter who doesn’t like to mix foods usually….like stir-frys and casseroles…she’s not a fan…but for some reason in soup, she’s ok with it! I consider myself an African Peanut Soup expert (snort, haa, kidding), so I can make this one and let you know how it compares. It sure sounds great, and I love sweet potatoes already. you have sweet potato haters in your life too? my husband won’t eat them…. more for me! My hubby won’t eat any kind of potatoes….unless they are in french fry form and deep fried in oil! Like you said, more for me!! My kids like them simply roasted and plain…gotta love that!